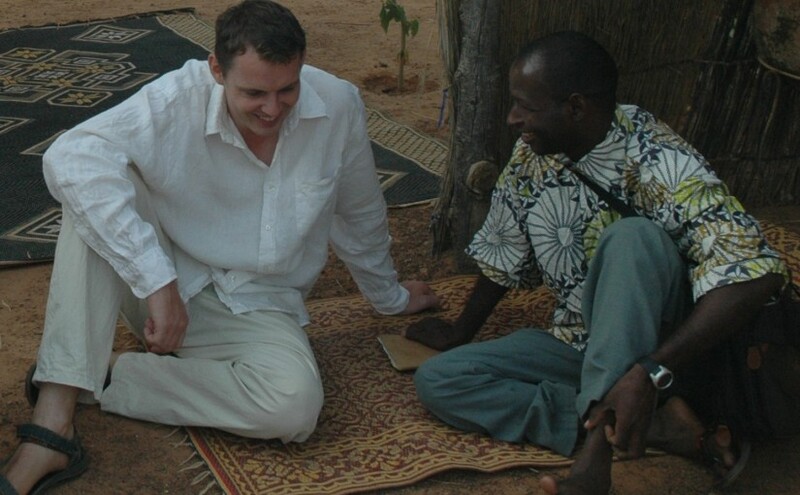 One of my favourite things to do in Burkina Faso was to visit remote cattle-herding settlements and listen to folk stories told by ingenious Fulani men, women and children. Many of these stories were ‘trickster’ tales, where a small cunning rabbit succeeds in outwitting larger, fiercer creatures. The downfall of the big creatures tended to be provoked not just by the rabbit’s cleverness, but by their own greed, pride or anger. Last September my new book for schools came out. Published in the Harper Collins ‘Big Cat’ series, it is a collection of four traditional Fulani tales in which the wily rabbit pits his wits against Hyena and Crocodile. 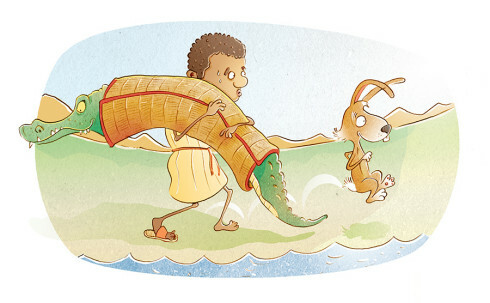 It is illustrated by Steve Stone, who has brought the tales wonderfully to life. This year I am offering Year 4 workshops based on the book. The format of the session is as follows: we start with a quiz that highlights the importance of the ‘trickster’ figure in ancient and modern storytelling, from Anansi to Puck to Robin Hood to Bart Simpson. Then we use concrete examples to tease out general characteristics of trickster figures. Finally, children work in twos to create and present their own trickster characters. This workshop is a great introduction to stories from other cultures. See my school visits page for details, or write to me at sahelsteve@gmail.com. 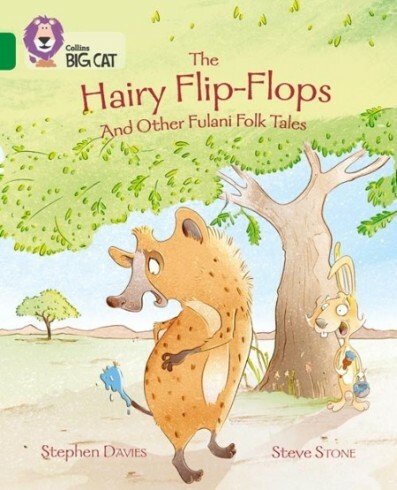 Here is a silly story based on a real Fulani folk tale. Hope you enjoy it. A shiny blob lay on the sand before him. ‘Gold!’ Lobbo cried. ‘A nugget of gold! A gleamy dreamy gobbet of gold!’ He picked it up and rode on. Pipers were piping. Drummers were drumming. A VIP was coming – but who? 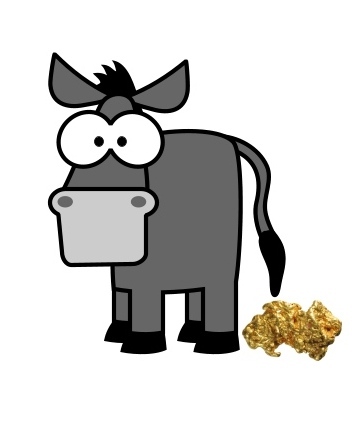 Lobbo turned and hid the gold nugget under Donkey’s tail. The donkey strained. The donkey shivered. The donkey brayed and his hind legs quivered. From under its tail fell a nugget of gold! The king stared. The princes and princesses stared. The knights and minstrels and horses and camels all stared. The kingly eyes grew big and round. He did a backflip to the ground. He lifted up the golden poop and gave a most unregal whoop. ‘I’ll give you this treasure chest,’ said the king. ‘It’s not enough,’ said Lobbo. The king, he broke his pipes and drums and kicked his fiddlers three. He ranted. He raved. He misbehaved. He punched a baobab tree. Three days later Lobbo got home. ‘Granny, I’m home!’ he cried. And caravans of camels that can carry all your stuff. ‘I sold him,’ Lobbo said. ‘He came BACK?’ cried Lobbo. Donkey stepped out from behind a tree and kicked Lobbo up the bum. And tell the king I’m sorry but our deal has fallen through.